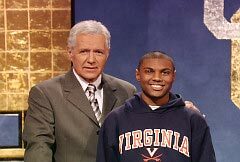 Are you as smart as UVA’s Jeopardy contestants? This is Jeopardy! It’s the TV quiz show that brings us together. 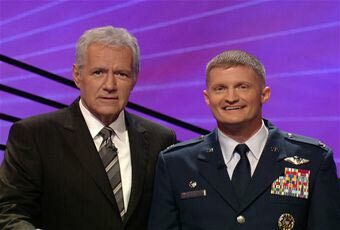 Who among us hasn’t sat around a living room or a college dorm room and pitted our brains against the three contestants on the TV, seduced by an untiring interest in trivia and the idea that, perhaps, we’ll know the question that stumps the contestants on screen? 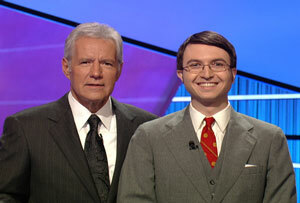 How could you resist participating in the national debate: Does Alex Trebek look better with or without a mustache? 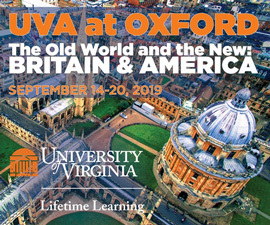 Learn about UVA alumni and students who have been recent contestants and test your own trivia knowledge against their correct responses on the show. Who is Dave Belote? Belote (Col ’85) is now the commanding officer at Nellis Air Force Base in Las Vegas. “I’ve been a fan of Jeopardy forever,” he says, dating back to his UVA days, when he played Trivial Pursuit with his buddies. “They were cutthroat games,” he says. The years passed and Jeopardy was always on in the background when he and his wife—Pamela R. Belote (Col ’86)—were cooking dinner or fussing at the teenagers to get their homework done. The decision to compete on the show seemed natural. “I had more fun than I can possibly describe,” he says, referring to his impressive six-show run. 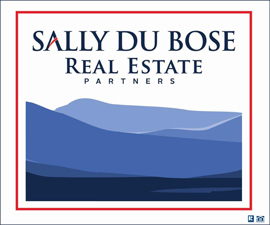 Belote now stands at No. 13 on the all-time winnings list.